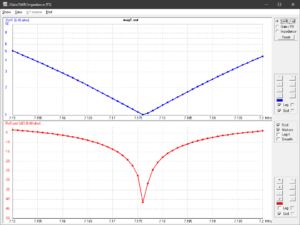 W5KV documented his measurements of a 3m perimeter circular transmitting loop, DELUXE HG-1 PreciseLOOP, 2.0m centre height above ground. 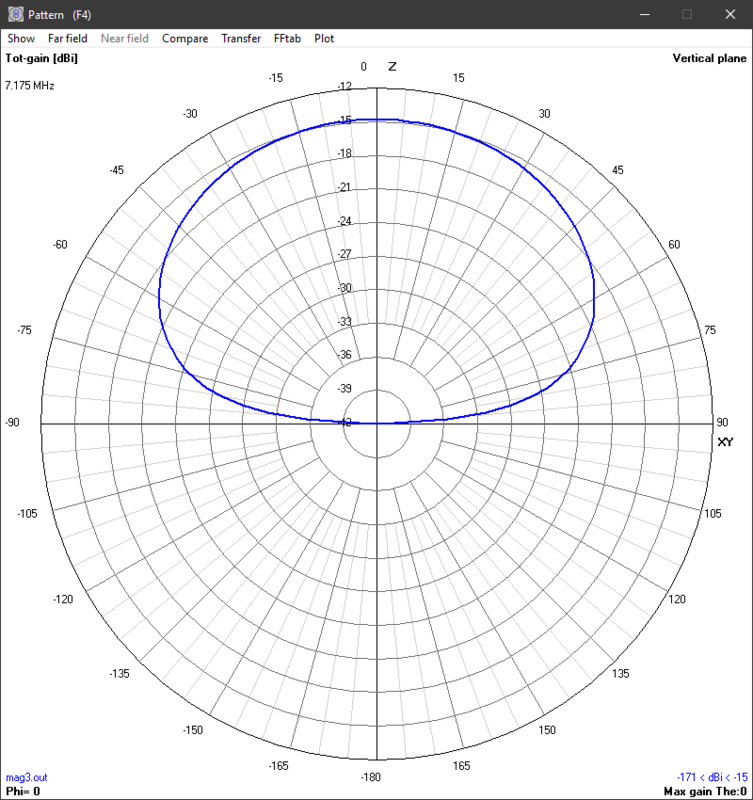 This article explores his 7MHz observations. Assuming the measurements were made with the antenna clear of disturbing conductors etc, in good condition. Above is his VSWR scan. Based on that, we can estimate the half power bandwidth to be 30kHz if R is less than Ro, more like 33kHz in the other case, but we will be optimists. 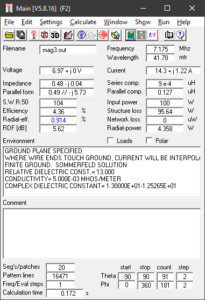 Above is the VSWR scan of the calibrated model, the load is matched at centre frequency and half power bandwidth is taken as the range between ReturnLoss=6.99dB points. 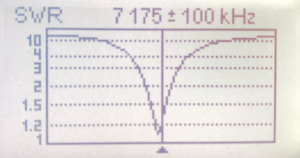 The NEC model reveals that the loop reactance is 121Ω. 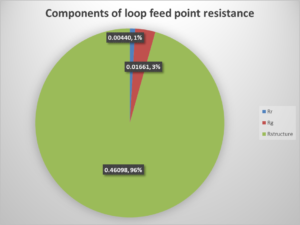 Above is a result screen from the NEC model showing some key quantities that can be used to dissect the feed point resistance into important components. Radiation Efficiency given here as 0.914% can be expressed as -20.4dB. 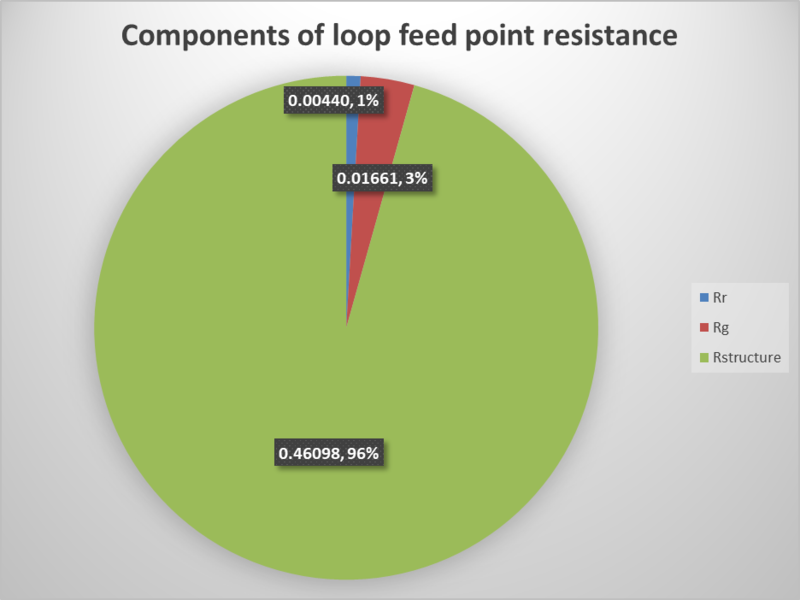 Above, decomposition of the total feed point resistance into components Rr (radiation resistance), Rg (ground loss resistance). and Rstructure (structure loss resistance). Also of interest is the gain calculated by the model. 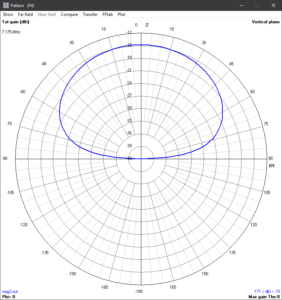 Above is the radiation pattern. 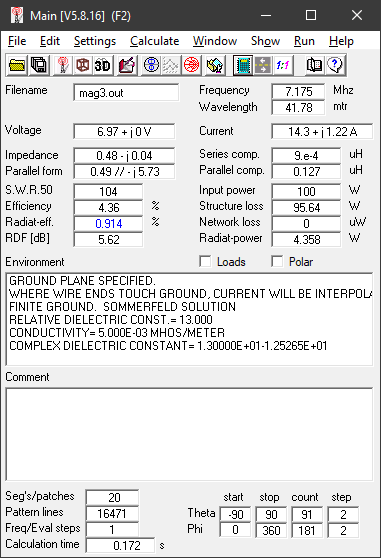 As expected for an STL near ground, the maximum gain is towards the zenith and in this case it is -14.8dB. The Directivity show in an earlier screenshot (as RDF) is 5.62dB. 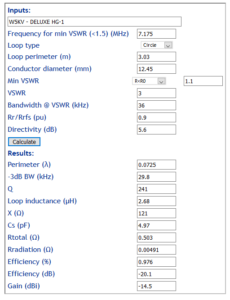 (Duffy 2014) is an online calculator for finding STL gain from bandwidth. 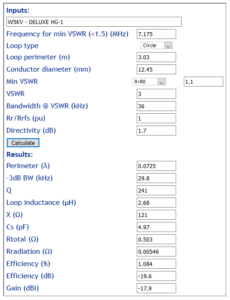 The basic calculator assumes free space conditions, but provision is made to tweak Rr and Directivity for ground effects. 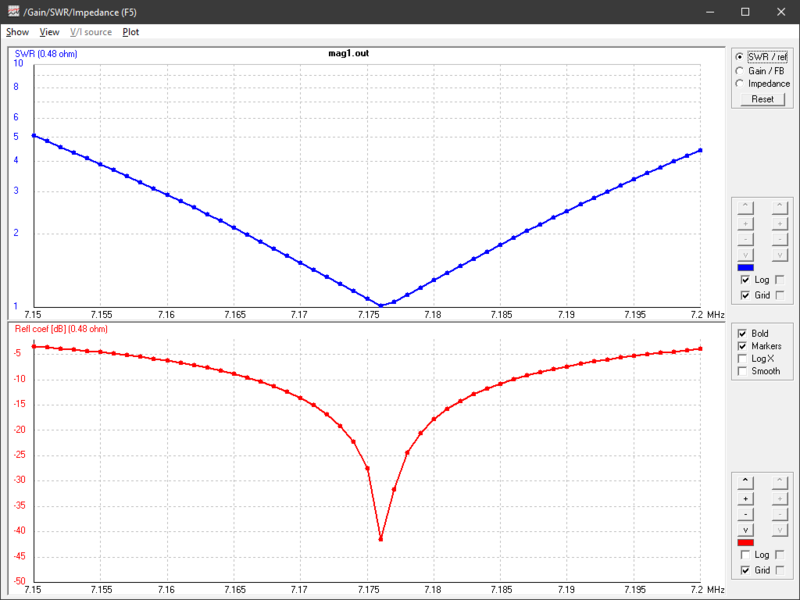 Above is the uncalibrated model, uncalibrated to mean using the bandwidth measured near ground, but Rr and Directivity for free space conditions. Note that the perimeter is 0.0725λ, within the stated accurate range of the underlying free space model. 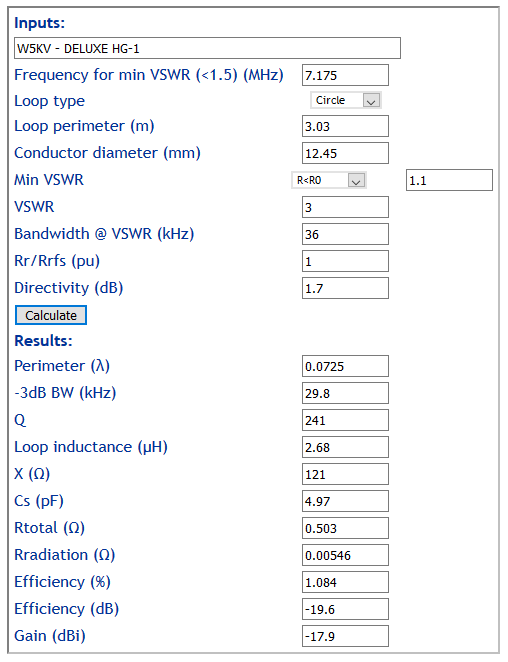 More importantly, NEC’s calculation of Rr of the loop in the presence of ground being 0.0048Ω is significantly less than predicted by traditional formulas. Adjusting Rr to the model (Rr/Rrfs=0.9), and Directivity to the model (5.6dB) we obtain an efficiency of -20.1dB and gain of -14.5dB which are both within tenths of a dB of the NEC model results. The model applies to the scenarios described, and extension to other scenarios may not be valid. 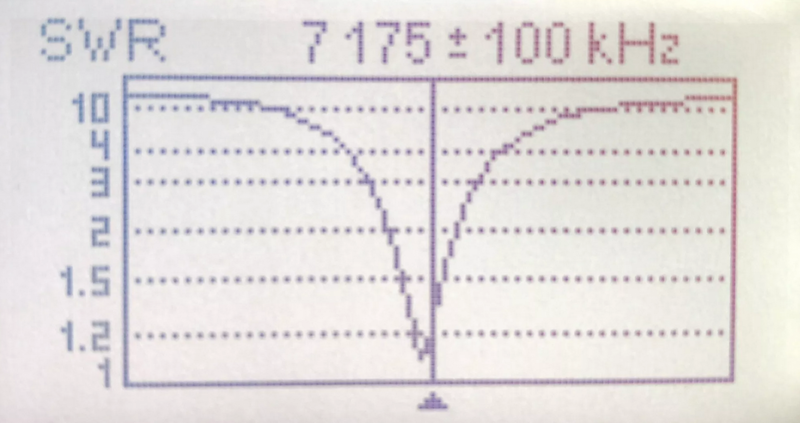 Calculate small transmitting loop gain from bandwidth reconciles well with the NEC-4.2 model. NEC-4.2 is a more complete model of the scenario and when calibrated to the measured half power bandwidth, it probably our best analytical estimator of radiation efficiency. Duffy, O. 2014. 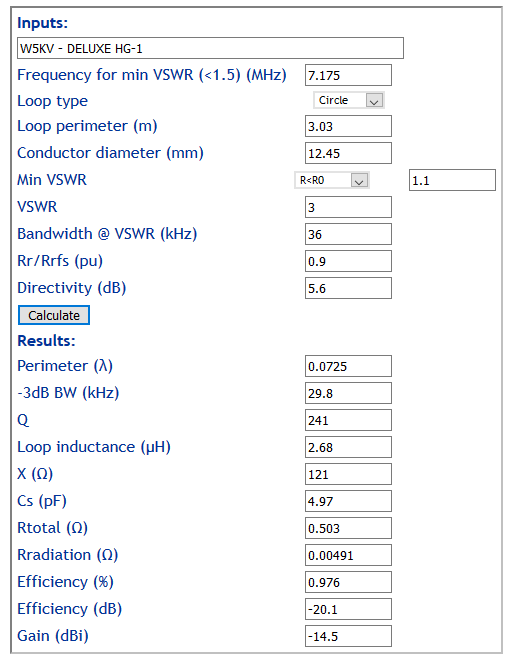 Calculate small transmitting loop gain from bandwidth https://www.owenduffy.net/calc/SmallTransmittingLoopBw2Gain.htm.